Bungo was raised in the Vequerrel Woodlands by his mother and father. He was very curious and and cantankerous. The over protectiveness of his mom lead him to push out further and he began like any halfling to toy around in the local forests. Little did he know that he was born on a leyline and due to this possessed a higher aptitude towards the learning and use of magic. It was here that he was discovered by a mage. Bungo does not remember more than the mage asking his parents for permission to take Bungo to mage school in exchange for some goods and the knowledge of his village to remain a secret. At this school Bungo was trained by an aging mage. He was quite stick and boring. This was where Bungo met Azariel and he was enamored by his openness to the ideas Bungo had. Therefore they became the best of friends and even got B.F.F. necklaces. So through all the shenanigans that were had Bungo continued his training. His teacher grew ill one day and passed away. After this, Bungo saw this opportunity to leave and explore the world. He explored much of the Vequerrel Woodlands. This was where he met Sallowan Willowwatcher. Sallowan was a strange person. He loved the woods and the forest and all its critters. Together Bungo and Sallowan fought the most epic battles against poachers, loggers, and slayers of innocent woodland critters and fairies. Through all this turmoil Bungo and Sallowan have shared many a pipe and euphoric drug. 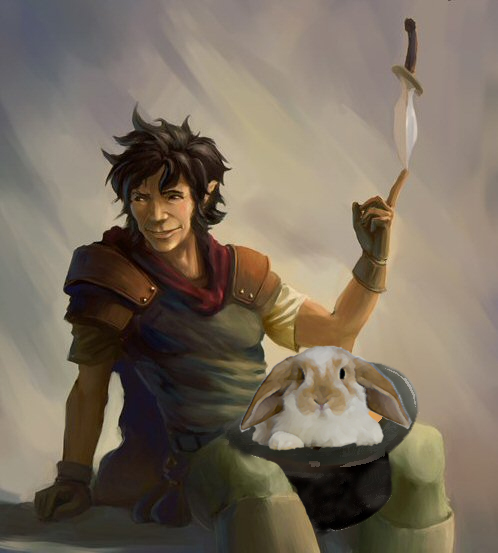 Bungo was given Now You See Me as a gift for his participation in the great slaying and exodus of the woodsmen, loggers, and poachers. However, in the end Bungo became bored once more and traveled home for a while, which was super boring, so he decided to seek out his old mentor Azariel. Together they have swooned the skirts off of many a woman and so on and so forth. Soon Bungo was introduced to the church of light. It was recommended he picked a deity to follow. Not entirely sure of the choice he was making, Bungo choose Bast because, well she was the most fun. Little did he know that this choice would change his life forever. Bungo continued his life in the Upper Kighfalton streets. There he relieved people of excessive wealth and spent hours playing tricks on the local town crier. Original halfling painting by Gasullator. Photo manipulation by PandaJester.